When a memory from the past isn’t healed, it remains active today, influencing your current life and mood. These memories can be healed and released by means with a skilled Akashic record reader. The Akashic records exist for everyone on this planet. It is a library of all that once was and is today. Your story of the people you’ve met and what they added to your life. Within the tapestry of the Akashic there is opportunity for great understanding and healing. Once you access this and learn of the agreements, your purpose, soul lessons, contracts, past lives or misunderstandings held here, transformation is possible. The Akashic Records contain the entire history of every soul since the dawn of creation. These records connect each one of us to one another. They contain the stimulus for every archetypal symbol or mythic story which has ever deeply touched patterns of human behavior and experience. They have been the inspiration for dreams and invention. They draw us toward or repel us from one another. They mold and shape levels of consciousness. They are are portion of the Divine Mind. They are the unbiased judge and jury that attempt to guide, educate and transform every individual to become the very best that she or he can be. Akasha is a Sanskrit word meaning “sky”, “space” or “aether”. The records are collectively understood to be a collection of mystical knowledge that is encoded in the aether. Which is a non-physical place of existence and can only be opened with the permission of the client. No one can enter without consent. The Akashic Records have been here since the beginning of time. The Records were accessed by ancient people of various cultures, including the Indians, Moors, Tibetans, Bonpo and the people of the Himalayas, Egyptians, Persians, Chaldeans, Greeks, Chinese, Hebrews, Christians, Druids and Mayans. Also, in the Bible the Akashic Records are called the Book of Life. The Old Testament mentions a collection of knowledge written on the fabric of reality. Now more than ever people are being inspired to connect and reconnect with the Akashic Records. It is a time for great change on our planet as we are being shifted in to the 5th dimension of consciousness. As the Mayans say, we are now in the 5th Sun. It can feel exciting and yet we can feel unsure as we are entering a time where so much is unfamiliar. During my session with Vanessa I found her to be…. simply beautiful… and a joy to work with . She was in tune and connected to my guides and on point when she gave me my reading. I felt really comfortable with her because of the light that I felt coming from her spirit in how she shared with me what she saw in my life. it was very clear to me that she has a conscious connection with the Divine Spirit and is called to do this work of helping to heal humanity and our world as a whole. 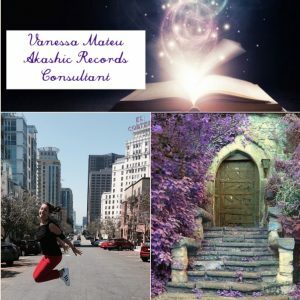 Having worked with my own Akashic guides and many others who do this work, it is refreshing to work with the clear channel Vanessa Mateu provides on this sacred journey. She is incredibly gifted and has done her homework. I was enlightened by her work and I consider myself a person who is discerning as we continue on this path we all have chosen. We are each part of this beautiful and amazing tapestry and she is able to discern where we fit and who to work with for our benefit. She is a gift to humanity and I for one, treasure her and recognize the role she plays in helping us get our internal work done. I am so happy Vanessa has taken on this endeavor, I am happy for us all. Physically, mentally and spiritually, Vanessa has healed and enhanced my life and I can’t be grateful enough. Over the last decade plus, her Reiki has helped me grow and heal in ways that scare me to think about when I realize if it weren’t for her, I would not be doing so great today. Most recently, when she went into my Akashic records, her insight was incredibly helpful and relieving. I was quite satisfied and even mystified with the accuracy of the results.